One of the most exciting parts of starting and maintaining a home garden is the ability to grow interesting and unique plants. 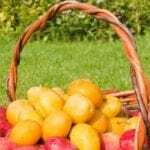 Heirloom vegetables, nut trees, and fruits are delightful additions for those wishing to expand their harvests and broaden their accessibility to specialty fruits and vegetables. One such rare fruit tree, the Mirabelle plum, has started to find its way into gardens across the country. Read on to learn more about this plum tree. What is a Mirabelle Plum? Mirabelle plums are a small, sweet type of fruit most commonly grown in the Lorraine region of France. These high sugar plums are renowned for their use in various jams, jellies, baked products, and fruit brandy (known as eau de vie). 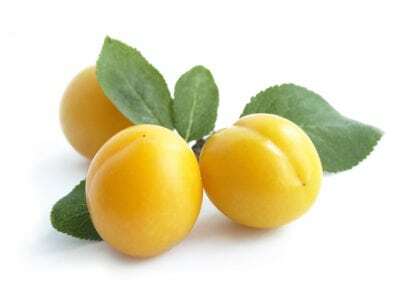 Though it is possible to grow Mirabelle plums in the home garden, true Mirabelle fruit (grown in France) will not be found in the United States due to bans on the import of the fresh fruits. While many gardeners may be left wondering why are Mirabelles banned in the U.S., this is mainly due to difficulties related to importing high quality, fresh products. Luckily, for those not able to make the trip to France, many varieties of Mirabelle plums are able to be grown in home gardens throughout the country. Hardy to USDA growing zones 5-8, mature plants reach heights of up to 12 ft. (3.6 m.). While requiring some space, care and maintenance are generally trouble free, aside from regular fruit tree pruning and fertilization routines. 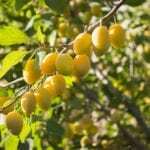 To plant Mirabelle plums, growers will first need to locate a supplier. Due to the nature of this fruit tree, it may not be found at local nurseries or garden centers. Fortunately, Mirabelle plum saplings can be obtained online. When ordering online, make certain to order from reputable suppliers to ensure healthy and disease-free transplants. When preparing to transplant the fruit trees, soak the root ball in water for an hour before planting. Select a well-draining location that receives at least eight hours of direct sunlight each day. Amend the planting area with high quality compost. Dig the planting hole to at least twice as wide and as deep as the root ball of the tree. Fill the hole with soil, making certain not to cover the crown of the tree. Though sometimes listed as self-fertile or self-fruitful, Mirabelle plums benefit from the planting of an additional pollinator tree as a means to increase yields and harvests.